Entry level suit, very robust material. 3 layers with stretchable panel on the back and floating sleeves. 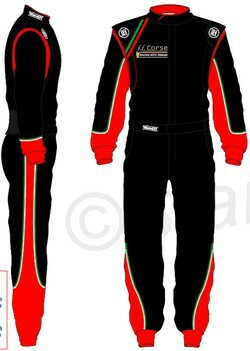 FFC Daytona 2: The FF Corse boot follows the same design cues as the suit. There is space available on the strap to have your name embroidered if you wish. The boot itself is constructed from high quality suede and features an anti vibration sole and shock absorbing heel. The Daytona 2 is our most popular selling boot and offers exceptional comfort, whilst being fully supportive to your ankle and offering great feedback through the sole of the boot. If you prefer, for an additional cost, we can manufacture the boot in grain leather. The Daytona II is Stand 21’s most popular boot, for the professional and gentleman driver. It offers superb levels of comfort combined with a timeless design. FFC Daytona: Much like the FF Corse boot, the glove follows the same design theme and, again, there is space available on the strap to have your name embroidered if you wish. The Daytona is also our most popular selling glove partly due to its pre-formed palm and cushioned protective pads which, between them, helps the driver to avoid blisters. Also each finger features leather patches for improved grip and the whole glove offers maximum fire-protection with three layers of aramid material.